Readers of this blog know that I do not think Greece should default. I stand by that call – but with progressively less conviction. Let me explain. First things first. 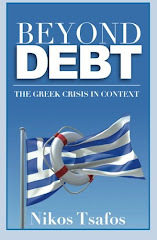 Debt is not the problem in Greece – it is a symptom but not the disease. Default without reform is like taking an aspirin for a toothache to avoid the dentist – it may help, but it’s no solution. That’s why I do not think default is good. But I also think that default should be constantly evaluated as an option. Our yardstick should be, will default help or hinder Greece’s transition to a more liberal, just, and market-friendly country? The question can be rephrased this way: Greece’s crisis marks the end of a political model where the state spent money it did not have, where political allegiance was purchased through state patronage, where the professional class did not pay taxes, and where the bill was passed on to future generations. This much is clear. What is not clear is whether the Greek public recognizes this crisis as such and whether it will accept the changes needed to correct it. Is the Greek public psychologically ready for change? Or does it need to hit rock bottom to see the need for change? And if it does hit rock bottom, what kind of change will it demand? Our questions then are: what are the ideas that are lying around Greece these days? What ideas will be lying around if Greece defaults? How will Greek society respond to further distress? Will it turn more inward and xenophobic or will it seek new directions and a new, liberal voice? In a previous post, I noted that public discontent came from three corners: from those who stand to lose from reform; from those who are fed up with the political class as a whole; and from those who want to see more reform faster. A different way to think about Greece’s future is this way: how is the Greek public distributed among these three groups? And what political alliances may be formed between them? If opposition from Group A – those who stand to lose from change – proves impossible to overcome, the reform agenda will collapse. Such an outcome would be triggered by the inability of the government to convince the public of the wisdom of its agenda or impose order when that agenda is challenged. Unable to pass reforms, the government would fall, leading to default. The only way to avoid default would be for Europe to keep lending money to Greece despite a political collapse – an unlikely outcome given already limited support for more loans. If Group B – those generally fed up – sustained their opposition, the country is more likely headed towards a low-level attrition game where political support crumbles across the board and where support for any initiative decreases. Given the strong call for “justice” (broadly understood), the country could see a stronger populist turn. It is no coincidence that the far-right LAOS party got the highest share of “positive” votes in a June 2011 poll. If Group C – the impatient reformers – grew in numbers, then the government would have to either toss out feeble reforms in exchange for a much bolder program, or it would collapse by its inability to move fast enough to win over the reformers. In such a scenario, an electoral victory by the opposition party would be most likely. Even so, it is quite possible that the reformers would find that few in the political class represent them – thus the reform vote may be split and hence find it hard to be articulated in a political program. To play out these scenarios we need to think about the day after default: what will Greeks think about it? A poll on who is responsible for Greek debt is instructive. Greek governments received universal rebuke – by just behind them to blame were speculators, banks and the big EU states such as Germany and France. Only much lower, at 52%, were the people really to share some of the blame themselves (up from 44% in November 2010). If a default leads to the lesson that banks and the EU were out to get Greece, then no healthy prescription will come of it. In an ideal world, Greece would have serious leaders. Even in the current climate, strong leadership could go a long way to restoring hope (here and here). Alas, we have no such leaders. In their absence, the public may either repudiate politics as a whole and thus plunge the country into further crisis – or it may follow the lull of populists who offer the mirage of justice in tough times. In those moments of darkness, perhaps a sliver of leadership will shine – a person to speak truth to this country – a person to narrate how they country got into this hole, how it may get out, and where it may get out to. Betting on that leadership is betting against the odds. Without it, Greece’s best hope is its current ineffective leadership with strong external supervision to sustain reform. Default could offer some economic reprieve once the country bounces back from its nadir; but the political nadir will be harder to bounce back from. At times, I wonder whether Greece can wake up without hitting a nadir, if default is necessary to allow the country to implement more radical change. But then I look at the body politic, at the ideas that float around in the country – at what the day after may bring. Default is not the path to political revival. It is the path to political darkness. And that’s why I am still against it. of any personal aggendas. Well done, once again. will do things on the 11th (if not 12th) hour. our export markets outside the eurozone. how???? with so much red tape and corruption. First off, thanks for your kind words - they are much appreciated. In general, I do not think that Greece leaving the Eurozone would be the catastrophe that some people make it out to be - nor do I think it will be the boon that others claim. As I see it, our problems are only incidentally currency problems - they are, more fundamentally as you say, structural problems. We had a drachma for years - where did it get us? Will Greece be a better place to invest if we revert to the drachma? Doubtful. Will we be more competitive? Sort of, but only in a superficial kind of way. Perhaps inelegantly, I like to think of Greece as having grown too fat for its pants. It can go get new pants, which is the equivalent to devaluation. Or it can eat right and hit the gym. Nikos,couldn't a devalued currency lure investors into Greece,because the country would be "endowed" with a cheap(and hopefully efficient)labour force?Of course,purchasing imports would become a luxury for many Greek households,but such a solution would counter-actively minimize unemployment and increase exports. Selene, in theory yes. A devalued currency would make investing in Greece more attractive and exports from Greece more competitive. But devaluation is merely cosmetic change and a currency cannot hope to resolve the myriad problems that the country faces. Take corruption or labor unions, both of which can impede foreign investment and competitiveness. Does a devalued currency do anything to resolve them? No. See also my post: Is Leaving the Euro Good for Greece? You really think banks are not out to subjugate nations? Have you been not paying attention since at least 2008? You leave the banks out of every equation you formulate. This is such a major omission in your analysis, that it negates everything you write. Make money, yes. Subjugate nations? No.